These long stemmed cabbage flowers were in a large bunch at a local florist. Doubtless they were flown into England from many carbon miles away but you can easily grow your own ornamental cabbage. 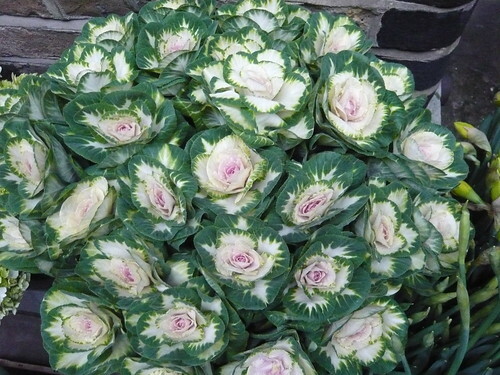 Large ornamental plants with frilled edges and an ornamental coloured heart. Colour vary with cream, pink and maroon being popular. When large enough to handle, transplant to 3in pots. Harden off spring sown plants and plant out 12-18in apart in the border. Pot up summer sown plants into 5in pots or containers and stand out of doors on a sheet of polythene to prevent root penetration into the soil. Water regularly and give weak doses of a high Nitrogen fertiliser every 14 days. Plant out in late summer in beds, window boxes, containers, etc. The leaf colour change occurs as the night temperature drops in late summer. In late winter they produce a tall flower spike which makes an unusual floral decoration. Eaten raw or cooked, cabbages are an excellent source of Vitamin C.
Try to use all healthy outer leaves as the darkest green leaves contain the most nutrients. Ornamental cabbages are edible when young although the flavour can be rather strong. Vary the colour of your coleslaw with some chopped ornamental leaves.